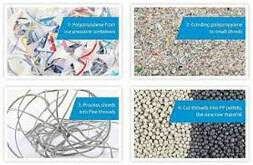 Plastic Recycling Verstraete (PRV), a spin-off company of Belgium-based In-mould label specialist, Verstraete IML , processes 3,500 tonnes of polypropylene (PP) waste into new raw material PP pellets each year. The company, which is located near its parent company in Maldegem, produces the pellets for the automotive and the roof cladding industries to produce tyres and roofing. Koen Verstraete, CEO of Verstraete IML, adds that apart from offering this sustainable solution to keep the waste PP off the incinerators, the PRV creates extra employment in the region.. He envisions his company to be able to recycle waste from outside Verstraete IML, and possibly also other types of plastic. Arguing that PP is recyclable, the CEO believes that the material should be reprocessed on a larger scale. Thus, he urges the government: to collaborate with this ecological effort, which is enable producing up to 45 million PP labels daily and processing PP tubs and lids into brand new materials.